The Freedom From Religion Foundation’s Winter Solstice sign is back in the Milwaukee County Courthouse. County Executive Chris Abele graced the installation ceremony on Monday, Dec. 3. FFRF put up the display with the help of member Ted Shellhamer. 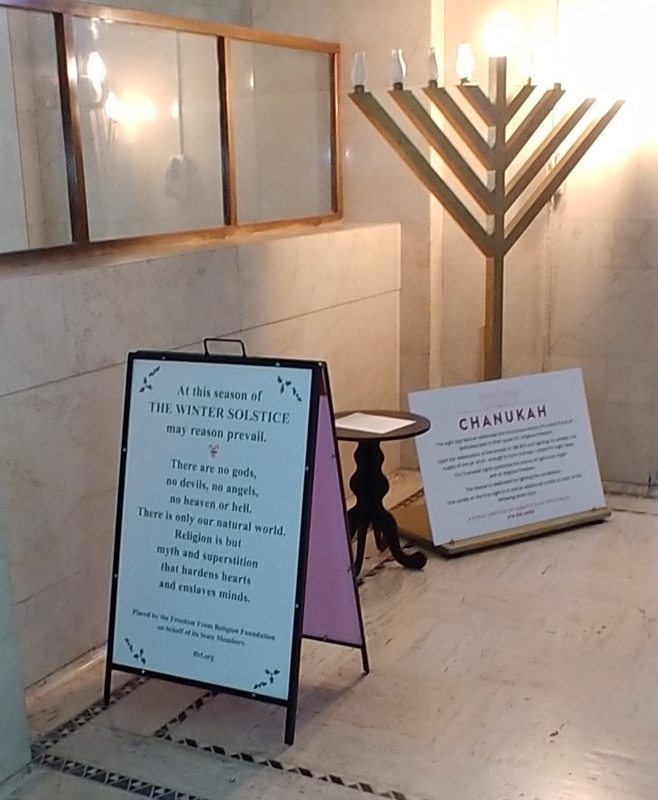 FFRF has placed the message in the courthouse alongside devotional displays to emphasize that nonreligion must be given space alongside religion in public forums. The Winter Solstice sign was originally put in the courthouse to counteract an inappropriate nativity scene plunked there in 2009. A Pew survey a few years ago revealed that one in five Milwaukee County residents is nonreligious, including one in three young persons. FFRF thanks Ted Shellhamer for his assistance and activism. The national state/church watchdog, based in Madison, Wis., has approximately 32,000 members and several chapters all over the country, including almost 2,000 members and the Kenosha Racine Atheists & Freethinkers (KRAFt) chapter in Wisconsin.